Taurus 66; 7-shot LBR for sale. Adjustable open sights in good condition. Comes with Taurus mounting rail. An immaculate Taurus .22 LBR has had the brace removed and a stainless rod and finisher fitted. Taurus Model 456 .45ACP Revolver with 12" Barrel Matte Stainless Steel with CIP Proofing. Fitted with Long Arm Band and to be sold under Section 1 License. A very hard to find Taurus in .22LR fitted with a straight bar. 12" Barrel with Taurus factory 6" Weaver rail. 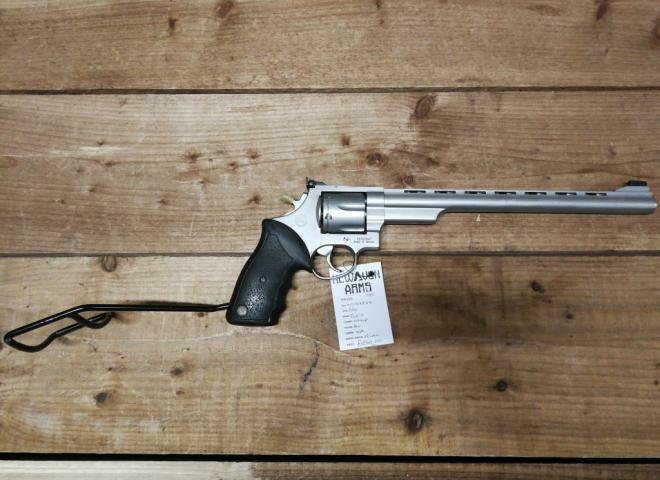 Lovely Taurus 7 shot stainless revolver. Rear sight replaced by weaver rail and a Vortex Razor 6moa red dot sight installed. Comes complete with 2 speedloaders in a carry slip with original manual. Last new stock coming into the country. Get them whilst you can. We are able to fit the ambidextrous "tear drop" rod (shown in pictures 2 & 3). Please call for details.